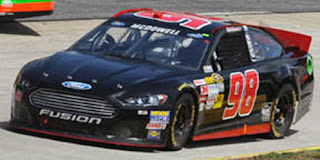 Michael McDowell picked up the 25th last-place finish of his NASCAR Sprint Cup Series career in Sunday’s AAA 400 at the Dover International Speedway when his unsponsored #98 Phil Parsons Racing Ford fell out with brake problems after he completed 107 of the race’s 400 laps. The finish was McDowell’s sixth of 2013, his first since Chicagoland two races ago, and his third in the last four races. He now holds sole possession of the 2013 LASTCAR Cup Series Driver’s Championship by one finish over Mike Bliss. Bliss and the #19 Humphrey-Smith Motorsports team were once again absent from the Cup Series entry list. With seven races to go, however, the LASTCAR Cup title is still anyone’s to win. McDowell qualified 34th for Sunday’s race at an average speed of 156.883 mph. Without Bliss on the entry list, all 43 entrants made the field. Though just two cautions slowed the first half of the event, Sunday’s race saw an intense battle for last place. 43rd originally belonged to Tony Raines, who started there in his #40 Hillman Racing Chevrolet. However, Josh Wise slipped behind him when an unscheduled stop cost his #35 MDS Transport Ford three laps. Wise returned to the track as several others slipped down to the Bottom Five. With no one falling out of the race in the first quarter of the distance, Dave Blaney, Ryan Truex, Reed Sorenson, Timmy Hill, and Joe Nemechek all slipped in and out of the final five spots. Near the one-quarter mark, it appeared that Nemechek would prevail. The owner-driver’s #87 spent nearly eighty laps behind the wall, nudging Josh Wise off the 43rd spot. It appeared he would not return to the race, and I even posted on Twitter that he had secured the record-breaking 33rd last-place finish of his Cup career. However, unconfirmed Twitter reports indicated Nemechek’s crew was welding together a broken part and looked to return the track. Nemechek did, in fact, return, by which point he was twelve laps behind the new 42nd-place driver Michael McDowell. McDowell had pulled behind the wall while Nemechek was in the garage and, unlike Nemechek, did not look to return. Thus, when Nemechek passed McDowell on the track around Lap 185, the #98 ended up with 43rd place. Rounding out the Bottom Five were Josh Wise, who finally exited the race twenty-one laps after McDowell, Reed Sorenson in his return to the Leavine Family Racing #95, Tony Raines, and Nemechek. Nemechek’s listed reason out is suspension trouble, which may indicate this was what the team had tried to repair. *This was McDowell’s first last-place finish in a Cup race at Dover since the spring of 2011, when his unsponsored #66 HP Racing Toyota fell out with electrical problems after he completed forty-five laps of the FedEx 400 Benefitting Autism Speaks. *This was the first time the #98 has ever finished last in a Cup Series race at Dover. Danny Efland picked up the 3rd last-place finish of his NASCAR Nationwide Series career in Saturday’s 5-Hour Energy 200 at the Dover International Speedway when his #50 Defiant Whisky Chevrolet fell out with a vibration after he completed 4 of the race’s 200 laps. The finish was Efland’s first of 2013 and his first in a Nationwide Series race since May 24, 2008 when his #0 Shred 360 / Lori Morgan, LLC Chevrolet was involved in a single-car crash after three laps of the Carquest Auto Parts 300 in Charlotte. Efland, a 24-year-old racer from Irmo, South Carolina, is competing in his sixth Nationwide Series season. His best finish in 63 career starts was a pair of 13th-place finishes in both Daytona races in 2012. Both times, Efland drove the #4 Chevrolet fielded by longtime car owner Johnny Davis. The majority of Efland’s starts have come with Davis’ JD Motorsports team, but he’s also raced for Go Green Racing, Corrie Stott, Jimmy Means, Mike Harmon, and his own family-owned team. This year, Efland began the season with Davis, coming home 25th at Daytona in the #4 Flex Seal Chevrolet. Following two starts in Mike Harmon’s #74 Chevrolet, Efland moved to the Mark Beaver-owned #50 team. Earlier this year, Beaver fielded a #50 Chevrolet that gave Efland his best career Truck Series finish in ten starts - a 20th at Charlotte. Beaver had also entered cars in the last two Nationwide Series seasons with drivers T.J. Bell and David Starr. Bell gave the team it’s best finish to date, again at Charlotte, when he came home 23rd in the fall of 2011. Efland and Beaver made their 2013 debut at Iowa in August, where he came home 34th. Following a 35th-place finish at Atlanta, Efland failed to qualify for the team’s next two attempts at Richmond and Kentucky. 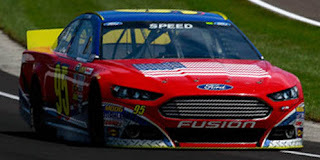 However, with just 39 cars entered at Dover, Efland was guaranteed his sixth start of the year. He secured the 32nd starting spot with an average speed of 144.329 mph. Four laps into the opening green-flag run, Efland pulled behind the wall, edging Josh Wise in The Motorsports Group’s #42 by three laps. Rounding out the Bottom Five were Chase Miller in the Rick Ware-prepared #15 Chevrolet, J.J. Yeley, Wise’s teammate, in TMG’s #46, and 2013 LASTCAR Nationwide Series champion Jeff Green. Green now has five races left to score a record-breaking 13th last-place finish in 2013. *This was the first last-place finish for the #50 in a Nationwide Series race since last fall at Texas, when T.J. Bell fell out with engine trouble after one lap of the O’Reilly Auto Parts Challenge. Bell was driving Mark Beaver’s #50 Gulf Coast Loss Prevention Chevrolet. The number had never before finished last in a Nationwide Series race at Dover. *This was Efland’s first last-place finish in a Nationwide Series race at Dover. Chris Lafferty picked up the 8th last-place finish of his NASCAR Camping World Truck Series career in Saturday’s Smith’s 350 at the Las Vegas Motor Speedway when his #0 Koma Unwind Relaxation Drink Chevrolet fell out with transmission trouble after he completed 2 of the race’s 146 laps. The finish was Lafferty’s fifth of 2013, his first since Iowa, two races ago, and his third in the last four races. With five races to go, he now holds a two-finish lead over Chris Jones in the 2013 LASTCAR Truck Series Driver’s Championship. Just twenty-nine trucks showed up to compete in Saturday’s race, making it the shortest Truck Series field since July 27, 1996, when twenty-eight trucks started the Western Auto 200 at the I-70 Speedway in Odessa, Missouri. Forty trucks competed in the Las Vegas event when it was the season finale in 1998. Due to the short field, everyone who attempted to qualify made the show. Lafferty timed in 27th at an average speed of 157.650 mph. Two laps into the race, Lafferty was behind the wall. He was followed two laps later by Caleb Roark, making his first start of 2013 in the #07 Front Row Tailgating / Silver Sevens Toyota. Chris Jones, Lafferty’s closest competition for the LASTCAR title, fell out three laps after Roark in his #93 RSS Racing Chevrolet. Rounding out the Bottom Five were Norm Benning in his #57 and Mike Harmon in Chris Fontaine’s #84. 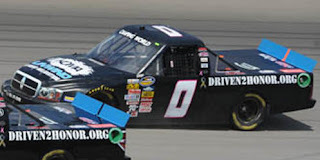 *This is the first time the #0 has finished last in a Truck Series race at Las Vegas since 2008, when Chris Jones’ ASI Limited Chevrolet fell out with a vibration after two laps of the Qwik Liner Las Vegas 350. *Lafferty had never before finished last in a Truck Series race at this track. Scott Riggs picked up the 10th last-place finish of his NASCAR Sprint Cup Series career in Sunday’s Sylvania 300 at the New Hampshire Motor Speedway when his unsponsored #95 Leavine Family Racing Ford fell out with brake trouble after he completed 92 of the race’s 300 laps. The finish was Riggs’ fourth of the year and his first since earlier this year in Kentucky, eleven races ago. Riggs remains second in the 2013 LASTCAR Cup Series Championship, but now one finish behind Mike Bliss and Michael McDowell with eight races still to go. Riggs was making his first Cup start since that same Kentucky race. That day, Riggs was making his sixth start of the season for Xxxtreme Motorsports, whose distinctive #44 Fords ran a part-time schedule this season. Since then, Xxxtreme has not attempted another race, and Riggs has made just one start in NASCAR’s top three divisions - a 29th-place finish driving for Ricky Benton in last week’s Truck Series race in Chicago. For Sunday’s Cup race, Riggs was tabbed to drive for Leavine Family Racing, another single-car team. Leavine’s #95 had two last-place finishes this season, both with former Formula 1 and Red Bull Racing driver Scott Speed aboard. Speed finished a season-best 9th at Talladega in the spring, allowing the Leavine team to extend its partial season, but he was replaced two races ago at Richmond by Reed Sorenson. Following Sorenson’s back-to-back 42nd-place finishes with partial sponsorship on the hood of the car, Riggs was tabbed to take over in Loudon. Riggs qualified 40th for Sunday’s race at an average speed of 131.035 mph. With Mike Bliss and the #19 Humphrey-Smith Motorsports team missing from the entry list for the third time in the last four races, all forty-three cars that arrived made the starting field. Michael McDowell, tied with Bliss for the LASTCAR lead, acquired a fully-sponsored ride with Phoenix Racing in the #51 SEM Chevrolet. Truck Series regular Johnny Sauter filled-in for McDowell in the #98 Phil Parsons enry. Riggs had a new sponsor on the hood of his car for Sunday’s race (UPDATE: Rob Dostie's photo reveals the sponsor as Star Coach Race Tours, which funded the #52 K-Automotive car earlier this season. The car also ran chrome wheels from Michael Waltrip Racing at one point, much like Whitney Motorsports did at Sonoma in 2011.). The race saw a surprising number of movement around the Bottom Five. Timmy Hill and his #32 U.S. Chrome Ford were the first to lose a lap, but when McDowell tangled with Josh Wise on Lap 31, the latter in a backup #35 ThePeteStore.com Ford, both slipped to the rear. Just after the restart, Jamie McMurray spun off the nose of teammate Juan Pablo Montoya, collecting Kevin Swindell. Swindell, making his Sprint Cup debut in the #30 Genny Light Toyota, suffered nose damage in the wreck that sent him behind the wall and back to 43rd. On Lap 53, just moments after the restart from the Swindell wreck, Bobby Labonte crashed on the frontstretch with an assist from David Gilliland, dropping Labonte’s #47 to 42nd. Swindell returned to the track, and by the one-third mark, Labonte dropped to what looked to be his third last-place finish of the year. But Labonte returned to the track as well, and by that point both Riggs and Sauter had pulled their own cars out of the race. Around Lap 200, Labonte passed Riggs, dropping the #95 to the 43rd spot. Joining Riggs and Sauter in the Bottom Five were Tony Raines, who ended up with the worst finish of the year for the #33 Joe Falk-owned entry, and both Labonte and Gilliland, who both exited the race with crash damage. *This was the first last-place finish for both Riggs and the #95 in a Cup Series race in New Hampshire. *This marks the third-straight year that a Ford has finished last in this event. EDIT (September 24): Updated article with pictures taken by regular LASTCAR contributor Rob Dostie. Great job, Rob, and thanks again! 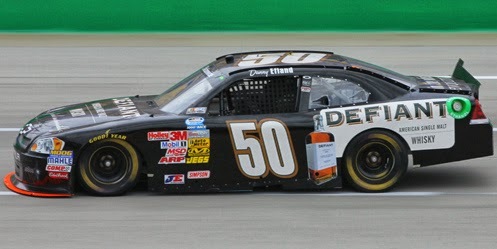 Jeff Green picked up the 50th last-place finish of his NASCAR Nationwide Series career in Saturday’s Kentucky 300 at the Kentucky Speedway when his unsponsored #10 TriStar Motorsports Toyota fell out with a vibration after he completed 3 of the race’s 200 laps. The finish was Green’s second in a row. It’s also Green’s twelfth of the season, tying NASCAR’s single-season last-place record he set last year. In 2012, he scored his twelfth finish with eight races to go, but Charles Lewandoski took over his “start-and-park” #10 for three of those final races while Green finished 15th and 16th in TriStar’s #44. Green qualified 27th for Saturdays race at an average speed of 171.325 mph, ranking him fourth among the eleven “go-or-go-homers” who attempted to qualify. The only driver to miss the race was Danny Efland, whose #50 missed edging Matt DiBenedetto for the final starting spot by just over half a second. In the race itself, Green and the #00 SupportMilitary.org Toyota of Blake Koch pulled behind the wall at almost the exact same moment. In reality, Green edged Koch by a single lap, scoring the record-tying finish. Rounding out the Bottom Five were T.J. Bell in The Motorsports Group’s #42, Carl Long in Mike Harmon’s #74 Dodge, and the other “start-and-park” TMG entry, #46, of Matt DiBenedetto. *Green not only swept both of 2013's last-place finishes at Kentucky, but also scored the third-consecutive last-place finish at Kentucky for the #10 TriStar Motorsports team. In the 2012 running of this race, Charles Lewandoski fell out with a vibration after four laps. Michael McDowell picked up the 24th last-place finish of his NASCAR Sprint Cup Series career in Sunday's GEICO 400 at the Chicagoland Speedway when his unsponsored #98 Phil Parsons Racing Ford fell out with brake problems after he completed 29 of the race’s 267 laps. The finish was McDowell’s fifth of 2013 and his second in a row. With nine races to go, McDowell is now tied with Mike Bliss for the 2013 LASTCAR Cup Series lead, giving him a chance at his third consecutive LASTCAR Cup title. Bliss didn’t run Sunday’s race as the #19 Humphrey-Smith Motorsports team withdrew from its second of the last three races. The #19 still leads McDowell’s #98 by one finish in the LASTCAR Cup Owner’s title. McDowell qualified 38th for Sunday’s race at an average speed of 183.331 mph. At the start, it first appeared that 43rd-place starter Tony Raines would score his first last-place finish since Phoenix in the fall of 2009. Raines and his unsponsored #33 Circle Sport Motorsports Chevrolet were the first to go down a lap, and he held the 43rd spot through the opening run. But when McDowell pulled behind the wall, Raines stayed out, and the finish went to the #98. Rounding out the Bottom Five were Reed Sorenson, who finished 42nd in his second-straight race for Leavine Family Racing; Josh Wise with his third-straight 41st-place finish in the #35 MDS Transport Ford for Front Row Motorsports; Tony Raines in the #33, who pulled out just before the five-hour rain delay split the race; and Cole Whitt, who authored the first of several spectacular second-half engine failures in his season debut as the new driver of the #30 Swan Energy / Lean 1 Toyota. *This was McDowell’s fourth last-place finish in this event and his third in a row. All three of his latest Chicagoland finishes have come while driving for Phil Parsons. *This was Ford’s 900th last-place finish across all three of NASCAR’s top divisions. Ford’s first NASCAR last-place finish came in NASCAR’s first-ever race - the disqualification of Glen Dunnaway’s #25 1947 Ford in the June 19, 1949 race at Charlotte Speedway. Jeff Green picked up the 49th last-place finish of his NASCAR Nationwide Series career in Saturday’s Dollar General 300 at the Chicagoland Speedway when his unsponsored #10 TriStar Motorsports Toyota fell out with a vibration after he completed 3 of the race’s 200 laps. The finish was Green’s eleventh of 2013 and his first since Iowa, six races ago. Green extends his LASTCAR lead to eight finishes over Blake Koch, and has thus clinched the 2013 LASTCAR Nationwide Series championship with seven races still to go. It’s Green’s third-consecutive LASTCAR title. If Green finishes last in any two of those remaining seven races, he will also break the single-season last-place record he set in 2012. Green’s finish came in his first race back in the #10 TriStar Motorsports team following a four-race stint in the fully-funded #14 Hefty / Reynolds Wrap Toyota. Green’s best run in that stretch was a season-best 16th last month at Bristol. The #14's regular driver, Eric McClure, returned to his ride at Chicago, having recovered from a sudden kidney failure that sidelined him for those races. During those four races, Green’s #10 was driven by Cole Whitt, who finished 14th at Bristol in a fully-funded effort, and in the other three “start-and-park” runs by The Motorsports Group driver Chase Miller. Miller failed to finish last in any of his starts, though he twice finished 39th at Mid-Ohio and Richmond. Miller did not have a ride at Chicago. Green secured the 40th and final starting spot for Saturday’s race. His qualifying time was disallowed due to a technical infraction. Missing the race were Josh Wise in The Motorsports Group’s #42, Carl Long in the Rick Ware #15, and Daytona last-placer Morgan Shepherd in his #89. At the start of the race, the leaderboard indicated that Juan Carlos Blum in the #23 VMP Nutrition / Oleofinos Ford would edge Green for the spot. However, Blum rejoined the race while Green fell to the last spot. Rounding out the Bottom Five were J.J. Yeley, last week’s last-placer in the #46 The Motorsports Group Chevrolet, Blake Koch with his eighth-consecutive Bottom Five in SR2's #00 Toyota, Tanner Berryhill who made his first start since Indianapolis by driving his family’s “start-and-park” #37 Dodge, and the Mike Harmon-owned #74 Dodge of Kevin Lepage. 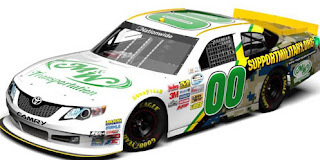 *This was Jeff Green and the #10 TriStar team’s second last-place finish in a Nationwide Series race at Chicagoland. 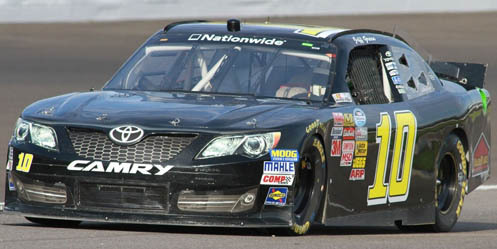 The other took place on July 22, 2012, when Green fell out with a vibration after 4 laps of the STP 300. Chris Jones picked up the 8th last-place finish of his NASCAR Camping World Truck Series career in Friday’s EnjoyIllinois.com 225 at the Chicagoland Speedway when his unsponsored #93 RSS Racing Chevrolet fell out with transmission trouble after he completed 3 of the race’s 150 laps. The finish was Jones’ third of 2013 and his first since Bristol, three races ago. With six races to go, the 2013 LASTCAR Truck Series Driver’s Championship is anyone’s to win: Jones and Chris Lafferty are just one finish apart with fellow RSS Racing teammate Johnny Chapman just one finish behind Jones. Chapman and Jones have a chance to give RSS its fourth-straight LASTCAR title. Lafferty looks to give Jennifer Jo Cobb’s team its first following Blake Koch’s loss in a tiebreaker last year. At Chicago Jones qualified 29th at an average speed of 168.471 mph. He pulled behind the wall one lap before Lafferty, the 36th-place starter, in his #0 Koma Unwind Relaxation Drink Chevrolet. Rounding out the Bottom Five were J.J. Yeley in the RSS #38, Danny Efland in the Mark Beaver-owned Advanced Electronic Services Chevrolet, and Norm Benning in the #57 Watt’s Truck Center Chevrolet. 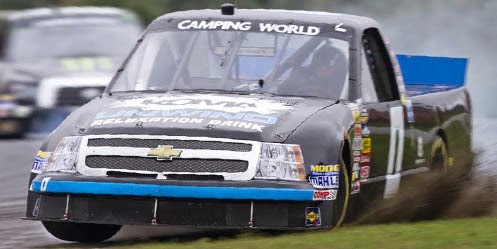 *This was the first last-place finish for a Chevrolet in a Truck Series race in Chicago since August 28, 2009, when Andy Ponstein’s #02 CorrieStottRacing.com Chevrolet broke the transmission on the opening lap of the EnjoyIllinois.com 225. Kyle Busch won that race, just as he did on Friday. *This was the first last-place finish at a Truck Series race in Chicago for Jones, the #93, and RSS Racing. Michael McDowell picked up the 23rd last-place finish of his NASCAR Sprint Cup Series career in Saturday’s controversial Federated Auto Parts 400 at the Richmond International Raceway when his unsponsored #98 Phil Parsons Racing Ford fell out with brake trouble after he completed 76 of the race’s 400 laps. The finish was McDowell’s fourth of 2013 and his first since earlier this year in Texas, nineteen races ago. With ten races to go, McDowell, the two-time and defending LASTCAR Cup Series Driver’s Champion, now trails Mike Bliss by a single finish. Bliss failed to qualify for Saturday’s race by eight hundredths of a second. With three DNQs and a withdrawal at Atlanta since their last start at Watkins Glen, the #19 Humphrey-Smith Motorsports team for which Bliss drives is still looking for its first start since Watkins Glen, four races ago. McDowell timed in 30th for Saturday’s field at an average speed of 128.047 mph. At the start of the race, however, last place switched between Reed Sorenson, making his first Cup start since last fall at Texas as the new driver of the Leavine Family Racing / Crusader Staffing #95, and Joe Nemechek in the AMFMEnergy.com Toyota. Nemechek had the upper hand for several laps, apparently headed to breaking his tie with the late J.D. McDuffie for the most last-place runs in Cup history. He returned to the track, however, while McDowell exited the race, and the #98 soon found itself in 43rd. Rounding out the Bottom Five were Sorenson, who was followed by Josh Wise, who also spent several laps going in and out of the garage area. Despite the birth of his second child, point leader Jimmie Johnson continued his late-summer slide with his third bottom-five finish in the last four races. His collision with the Turn 1 wall with fifty-five laps to go also brought out the first of two cautions that completely changed the complexion of the Chase field. Johnson still finished under power, as did Nemechek, who rounded out the Bottom Five. McDowell, Sorenson, and Wise were the night's only three retirees. As of this writing (late Sunday night), McDowell is still the official last-place finisher of this race. Just in case NASCAR’s review of the finish changes that, I’ll also say that Clint Bowyer has never finished last in 279 Cup Series starts, and a driver hasn’t finished last due to disqualification since Bobby Hillin, Jr. during the fall Charlotte race in 1992. *This is the first last-place finish for the #98 in a Cup race at Richmond since September 9, 1984 - 29 years ago today - when outside-polesitter Joe Ruttman’s Levi Garrett Chevrolet fell out with ignition problems after he completed 120 laps of the Wrangler Sanfor-Set 400. *This is McDowell’s first last-place finish in a Cup race at Richmond. J.J. Yeley picked up the 3rd last-place finish of his NASCAR Nationwide Series career in Friday’s Virginia 529 College Savings 250 at the Richmond International Raceway when his unsponsored #46 The Motorsports Group Chevrolet fell out with engine trouble after he completed 4 of the race’s 250 laps. The finish was Yeley’s first of 2013, but the second in three races for The Motorsports Group. Teammate Josh Wise trailed the field at Bristol. It is Yeley’s first last-place finish in the Nationwide Series since Kansas in the fall of 2011, sixty-three races ago. In doing so, Yeley has become the last-place finisher of the 1,000th NASCAR Nationwide Series race. Yeley qualified in the final starting spot for the 40-car field with an average lap speed of 119.069 mph. He edged Danny Efland for the spot by just five hundredths of a second. Efland was one of five drivers who failed to qualify, including Carl Long in Mike Harmon’s #74, Daytona last-placer Morgan Shepherd, three-time LASTCAR Cup Champion Derrike Cope, and Brett Butler in the SR2 Motorsports #00. During the opening green-flag run, Yeley edged Chase Miller for last place by a single lap. 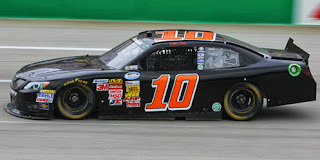 Miller, again in the TriStar Motorsports #10, finished 39th after qualifying 24th. Rounding out the Bottom Five were Josh Wise, Yeley’s TMG teammate in the #42, Matt DiBenedetto with his fourth Bottom Five in five starts for Vision Racing, and current 10th-place points man Parker Kligerman with his first Bottom Five of the year. *This is the first last-place finish for the #46 in Nationwide Series competition since 2012 at Kansas, when Chase Miller’s The Motorsports Group Chevrolet lost the ignition after four laps of the Kansas Lottery 300. 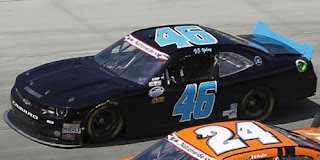 *Neither Yeley nor the #46 had ever before finished last in a Nationwide race at Richmond. Chris Lafferty picked up the 7th last-place finish of his NASCAR Camping World Truck Series career in Sunday’s Fan Appreciation 200 at the Iowa Speedway when his #0 Horejsi Graphics Dodge RAM fell out with handling woes after he completed 5 of the races 212 laps. The finish was Lafferty’s fourth of 2013 and his second in a row. He now holds a two-finish lead in the 2013 LASTCAR Truck Series Driver’s Championship. Lafferty qualified last in the 36-truck field with an average speed of 123.466 mph. While he drove a Chevrolet to the inaugural last-place finish at Canadian Tire Motorsports Park last week, both he and team owner Jennifer Jo Cobb drove Dodges with new sponsor Horejsi Graphics aboard. While Cobb finished 26th, Lafferty exited the race first to score the 36th spot. Lafferty has now finished last for three different manufacturers in 2013: Dodge (Iowa II), Chevrolet (Canadian Tire), and Ford (Kentucky, Iowa I). There is no word as of yet if Lafferty will run Toyotas before season’s end. Lafferty edged Jimmy Weller for last place, the Ohio driver falling out three laps later in his second career series start. Mike Harmon turned in the slowest time in qualifying, then pulled out of the race after 15 laps, followed by Bryan Silas with his worst finish since Martinsville and two-time 2013 last-placer Chris Jones in the #93 RSS Racing Chevrolet. *Lafferty has swept both Truck Series last-place finishes at Iowa in 2013. Scott Speed picked up the 7th last-place finish of his NASCAR Sprint Cup Series career in Sunday’s AdvoCare 500 at the Atlanta Motor Speedway when his unsponsored #95 Leavine Family Racing Ford fell out with a vibration after he completed 22 of the race’s 325 laps. The finish was Speed’s second of the 2013 season and his first since Charlotte, thirteen races ago. Since Charlotte, Speed and the Leavine Family team have made just four starts, finishing under power just once - a 28th-place run in the night race at Daytona. Atlanta was Speed’s third consecutive start in as many races, following a 41st-place run at Michigan and a 40th in Bristol, the latter just shy of the race’s halfway point. Following the injury of Bobby Labonte, slated to run the #51 Phoenix Racing entry in Atlanta, Mike Bliss drove the car in relief. Bliss’ #19 Humphrey-Smith Motorsports entry, a team which failed to qualify for the last two races, withdrew from the Atlanta event, so the forty-three cars that remained all made the race. Speed qualified 35th at an average speed of 182.747 mph. Bliss timed in 38th at 181.932 mph. Unable to take a qualifying time was Michael McDowell, who as a result started 43rd in his #98 Phil Parsons Racing Ford. In the race, Joe Nemechek fell to the rear first, but Speed prevented Nemechek from scoring his record-setting 33rd Cup Series last-place finish. Martin Truex, Jr. had qualified 7th, but his bid for a Wild Card spot in the Chase for the Sprint Cup Championship faced an obstacle when Truex fractured his wrist in a late-race wreck at Bristol. Though Truex was confident he could run the full race, Speed pulled his car behind the wall so he could stand by as a relief driver. Truex never got out. Even as his cast melted and came apart, Truex contended for the lead in the sprint to the finish before he came home 3rd. Heading to Richmond, Truex remains 13th in points, holding the second of the two Wild Card slots. The other Wild Card slot is currently held by Kasey Kahne, who fell out of the Top Ten in points following a collision with his Hendrick Motorsports teammates on an early restart. Kahne’s damage kept him 42nd in the early stages, but he eventually returned to the track and finished 36th. The final Bottom Five included McDowell, the MDS Transport Ford of Josh Wise, Nemechek, and Clint Bowyer, who briefly held the Cup Series point lead before an engine failure took him out of the race while leading. *This was the first last-place finish for both Speed and the #95 in a Cup Series race at Atlanta. *Ford had not finished last in a Cup race at Atlanta since March 12, 2000, when Jeff Burton’s #99 Exide Batteries Ford led five of the first 68 laps before he crashed out on Lap 70 of the Cracker Barrel 500. This race is better known for its finish where the late Dale Earnhardt edged Bobby Labonte in a photo finish by 0.010 second - a finish Kevin Harvick re-enacted almost exactly in Earnhardt’s car in the 2001 running. Blake Koch picked up the 4th last-place finish of his NASCAR Nationwide Series career in Saturday’s Great Clips / Grit Chips 300 at the Atlanta Motor Speedway when his #00 M&W Transportation /SupportMilitary.org Toyota fell out with ignition trouble after he completed 5 of the race’s 195 laps. The finish was Koch’s third of the 2013 season and his first since Mid-Ohio, two races ago. Koch now holds sole possession of second in the 2013 LASTCAR Nationwide Series Driver’s Championship, seven finishes behind leader Jeff Green. Green, still driving in relief of Eric McClure in the #14 Hefty / Reynolds Wrap Toyota, finished 29th when he was involved in a grinding crash exiting the quad-oval with thirteen laps to go. Koch qualified 32nd at an average speed of 170.763 mph, ranking him fourth among the ten “go-or-go-homers” who attempted to qualify. Following the withdrawals of both Ryan Sieg and Darlington last-placer Tanner Berryhill, forty cars qualified for as many spots, so no one else missed the show. During the opening green-flag run, Koch was the first driver behind the wall, followed two laps later by Josh Wise, the last-place finisher of the most recent race in Bristol. Rounding out the Bottom Five were Chase Miller, once again behind the wheel of the 2013 leading #10 TriStar Motorsports Toyota, Mike Harmon in his unsponsored #74 Chevrolet, and fellow owner-driver Morgan Shepherd, the 40th-place finisher in the July race at Daytona. *This was the first Nationwide last-place finish at Atlanta for both Koch and the #00. Chris Lafferty picked up the 3rd last-place finish of his NASCAR Camping World Truck Series in Sunday’s inaugural Chevrolet Silverado 250 at the Canadian Tire Motorsports Park when his #0 Koma Unwind Chevrolet fell out with clutch problems after he completed 3 of the race’s 64 laps. The finish was Lafferty’s third of the 2013 season and his first since Iowa, five races ago. Lafferty now leads the 2013 LASTCAR Truck Series Driver’s Championship by a single finish, breaking a tie with RSS Racing teammates Johnny Chapman and Chris Jones. 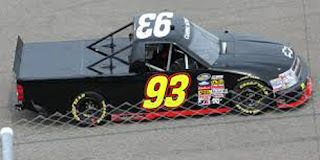 RSS entered just one truck in Sunday’s race - the #39 of Quebec native Alex Guenette. Lafferty qualified 29th in the 30-truck field at an average speed of 94.160 mph, placing him directly behind team owner Jennifer Jo Cobb and her 28th-fastest #10 Koma Unwind Dodge. Although the Ken Smith-owned #07 of Carl Long was the first truck to fall to the rear after an early spin, it was Lafferty who snagged last place when he edged Long by a single lap. Rounding out the Bottom Five were Johnny Sauter, whose mechanical struggles culminated with a stall on Lap 58 that brought out the third yellow of the day, Brennan Newberry in his family-prepared #24 Chevrolet, and the Kyle Busch Motorsports #18 Monster Energy Toyota of Joey Coulter, who finished under power despite stuffing his truck into the tires. After finishes of 6th or better in all five of his previous starts this year, Chase Elliott took the victory in a thrilling last-lap pass on Ty Dillon, who wrecked off the final corner while trying to save fuel. *Lafferty is the first Truck Series driver to finish last in a road course race since June 24, 2000, when Ryan McGlynn’s #00 Buyers Choice / Howes Chevrolet fell out with brake problems after the opening lap of the Bully Hill Vineyards 150. The race was won by current Sprint Cup Chase contender Greg Biffle. Finishing three spots in front of McGlynn was current Joe Gibbs Racing president J.D. Gibbs.